Apple’s iOS 7 beta has certainly gained the headlines this week, but while we fully expect the final release to operate across the entire iOS device range, the build released a few days back is only compatible with the iPhone and iPod touch. Why is that? 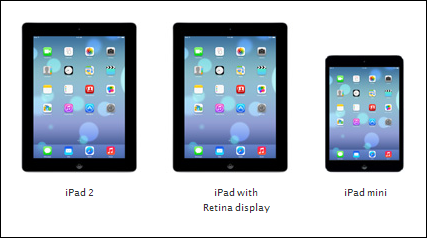 Well, it’s because the Cupertino company is behind on compiling the version for the larger display, but on the bottom of Apple’s official iOS 7 page, you can get an idea of how the home screens of both the full-size iPad and iPad mini will look once the forthcoming iOS release is able to grace it. To be honest, there’s nothing particularly riveting or surprising here and with opinion with regards to the iPhone / iPod touch version having been pretty divided thus far, I would imagine more of the same once iPad support is drafted in. One key difference between iOS 7 beta on the iPhone compared with the iPad, of course, is that the icons are a little bit more spaced out, and with color saturation rather on the strong side as part of the new-look home screen, perhaps the retinas of users will be spared when using the new software on a tablet. To be fair, it’s hard to gauge anything from simple pictures, but I have to say, the iOS 7 beta home screen does seem to take on a calmer disposition, but I don’t think this will be enough to alter the opinions of those who, on first impressions, seem to loathe every facet of iOS 7 beta. There’s no word on when iPad users will be able to take advantage of an iOS 7 beta, but considering the end user will be seeing it around September / October time, one suspects Apple will want to give it as much time in the hands of developers as possible. iOS 6 certainly wasn’t the fruit company’s most successful version to date, despite recording the highest number of installs among consumers and being adopted at a faster rate than ever before. Those figures were distorted by the fact that OTA updates, which people are far more likely to cooperate with, were only introduced with iOS 5, and I think the bit that sticks out in everybody’s mind is the post-launch furor around the disastrous Maps app, for which Tim Cook subsequently released an open letter of apology. We’ll be sure to let you guys know when iOS 7 beta does become available for iPad, so stay tuned! (Source: iGen [Google Translate]) Thanks, Valeed for sending this in!